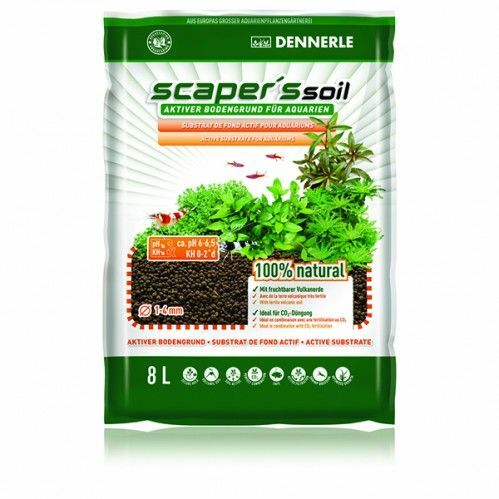 Scaper's Soil is a specially developed for aquariums, active ground. It creates a slightly acidic, soft water, as love most animals and plants from tropical areas. Scaper's soil is ideal for plant aquariums, especially aquascaping and shrimp aquariums. Scaper's Soil is made from 100% natural raw materials. Made from several carefully selected, natural earth, it provides all the vital minerals and trace elements, aquarium plants need daily. The irregularly shaped grains with a diameter of 1 to 4 mm can affect the soil particularly natural. Its open structure allows for optimal aquarium bed, plant roots can readily grow. Scaper's Soil provides the perfect base for healthy, vigorous plant growth and rich colors. Even Moose benefit from it and show it by compact growth and rich green leaflets. Due to the deep black color creates a more intense, vivid contrast to the bright green of the plants. The special nutrient formula - so the nutrients the plants will benefit primarily, but not the algae. By Nutrient Buffer function: like the battery, excess nutrients are taken from the open water and released back into the plants only when needed. Through the powerful promotion of plant growth - because good growing aquatic plants are the strongest opponents of the algae. Scaper's soil has active ion-exchange properties. Thus it lowers the pH and stabilizes (approx. pH 6.0-6.5) in the slightly acidic range. At the same time it reduces the carbonate hardness - depending on the initial water up to near 0 ° d CH - and makes the water thus significantly softer. He also serves as a natural source of valuable humic and fulvic acids, without coloring the water. To create Scaper's Soil water values ​​as they are used to in their natural habitats of numerous tropical aquarium plants and fish. Soft, slightly acidic water is perfect for use in most South American ornamental fish such as neon tetra, angelfish and discus. Scaper's soil is, in spite of the soft water, in combination with a CO2 fertilization safe for use as the pH is stabilized by the Soil. Scaper's Soil ensures crystal clear water and healthy living conditions. The porous surface provides the ideal substrate for the settlement of necessary bacteria. Thus, the entire ground is the huge bio-filter. He thus creates optimum conditions for effective biological self-cleaning and thus for best water quality. At the same time the soil binds numerous pollutants directly from the water. The granulate is distilled twice and thus also longer term water-stable.